Yesterday morning, a driver struck and killed 13-year-old Jazmine Marin as she walked across Cross Bay Boulevard at 149th Avenue on her way to school. The location is deadly — one other person has been struck and killed there since 2012, and Cross Bay is one of the most dangerous streets in the city. From 2009 to 2013, 17 pedestrians lost their lives on Cross Bay and Woodhaven Boulevard (the name of the same street north of Liberty Avenue) [PDF]. And yet, opponents of DOT’s Woodhaven Boulevard Select Bus Service project — which would create safer conditions by expanding pedestrian space and restricting vehicular turns — continue resist it by claiming pedestrians would be harmed. 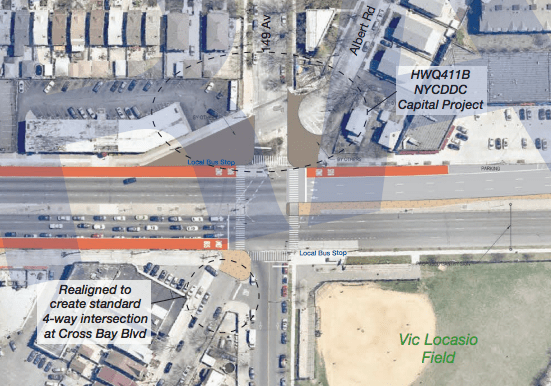 To win the support of local Council Member Eric Ulrich, DOT has already scaled back plans for left turn bans in the Woodhaven project — including one at Jamaica Avenue, where more pedestrians were killed between 2009 and 2013 than any other intersection in the city, according to DOT. While Ulrich is on board now, Queens Community Board 9 remains adamantly against the redesign. Despite the agency’s concessions, all but three CB 9 members voted last week to oppose the project. One person went so far as to say that if any fatalities occurred on the corridor after SBS implementation, “Their blood will be on your hands,” the Queens Chronicle reported. At the intersection of Cross Bay Boulevard and 149th Avenue, where Martin was killed, the city intends to square off an irregular intersection, expand a pedestrian median, and ban westbound left turns. It’s impossible to say whether those changes would have saved Jazmine Marin’s life, but those types of improvements are proven to reduce the risk of traffic deaths. To DOT’s credit, the agency is already redesigning the Jamaica Avenue intersection this fall, much to the chagrin of SBS opponents [PDF]. And it looks like the Woodhaven project remains on track to begin next year, despite the wailing from CB 9. “Woodhaven SBS is a safety project that we are implementing,” an agency spokesperson told the Chronicle last week. Other factors are also dragging out the process of making these major avenues safer. The city’s capital construction bureaucracy moves so slowly that full build-out of the Woodhaven project won’t be complete until sometime in the 2020s. What’s scary about the influence wielded by intransigent community boards is that they can water down safety projects before they get into that very long construction pipeline. The terrible loss of life on Woodhaven and Cross Bay Boulevards is a reminder that community boards retain this influence even though many of them are in complete denial about what’s causing traffic violence — and how to prevent it. Would the Health Department defer to a community board on whether to mount a vaccination campaign? This is insane. DOT should go ahead with whatever measures it believes are necessary to save human life, and if community board members don’t like it, they can vote for a different mayoral candidate with different priorities. As a former community board member, I am always bothered by the organized cycling community’s propensity for characterizing all boards with the same broad brush. Some community boards are fairly progressive when it comes to livable streets initiatives, some take proposals on a case-by-case basis, and others are indeed “intransigent.” Further, the community boards that fall in the first category are in no position to influence the thinking of the other boards, so why should they be subject to generalizations? When Transportation Alternatives and others say to the boards that are sympathetic to these issues, we don’t acknowledge (and implicitly don’t appreciate) your good work, it potentially creates a disincentive for those boards to continue taking thoughtful positions on similar proposals in the future. It seems like an unproductive and polarizing strategy to take. Good point. Streetsblog should create report cards for every community board and keep track of cooperation or intransigence. Also, I think you are wrong to say streetsblog is made up of the “organized cycling community”. I think most people here are primarily pedestrians that are appalled by the behavior of some motorists in this city. While cyclists are part of this constituency, they are not a majority. It just turns out that both pedestrians and cyclists benefit from street safety initiatives. Some of us are suspicious of the CB system itself, whether it’s doing “what we want” or not. They’re appointed, not elected, in a process that’s not particularly transparent, and they’re hyperlocal to a degree that is perhaps OK for walking improvements (except on the boundaries of CBs, which are often along major, dangerous roads!) but a problem for cycling and transit improvements. Improvements to cycling and transit routes are necessarily over a distance that spans multiple CBs. Even if they’re cooperative (and in the outer boroughs, getting more than one to cooperate at a time seems a rarity) it’s a long and painful process to get anything done. Frequently CBs demand many presentations of the same thing over months or even more than a year. This is even the case for projects that don’t change the basic geometry of streets, such as sharrows or door zone bike lanes! Are Community Boards ever constructive? They exist mostly to preserve the status quo, whatever it may be, rather than find solutions to problems. And from my experience attending CB meetings, the members are usually self-important reactionaries who think they know everything and who don’t listen. They’re also far older and whiter and generally unrepresentative of the communities they serve. Oh, and they’re appointed, rather than elected. So “broken” is right. They are supposed to represent local communities, but they are useless and undemocratic. Just remember why NYC needed appointed officials to actually “represent people.” That was a judgment on the City Council, which pre-term limits was occupied by perpetual incumbents like the state legislature. Thanks to term limits turning the City Council over a couple of times, I think it actually does represent New Yorkers for better or worse. That makes community boards less necessary. I think several of the responses prove my point. Another successful SBS line should finally shut up opponents of good bus service.